Google released an official notification to shut down its Social Networking platform Google+, due to low usage and challenges. It was introduced in the year 2011 as an bold attempt by Google to contest Twitter and Facebook. But due to lack of interest from users, Google took a final decision after 8 years of Google+ Launch. Consumer version of Google Plus is going to shut down on April 2, 2019, and Google will start deleting the content. If you are actively using this the social platform then it’s the right time to download Google Plus data. You can download Google + 1s on websites, Google+ Circles, Google+ Communities, Google+ Streams, etc. What Google Plus Data You Can Download? Google+ Stream: Select this to download data like Photos, Events, and Post. Download all post you created including comments, +1’s and all other activity. Download all Events you created or you were invited. Download Photos you shared through post or in comments. Google+ Circles: Select this to download Google+ circle data. Google+ Communities: Download data of your created Communities or if you were managing it as a Moderator. Download Names and Links of G+ Profile of Community Owners, Moderators, Members, Applicants, Banned Members, and Invitees. Links you shared in Community in Post. Download Community Metadata, community picture, settings, content control settings, role and community categories. From March 2019, you can download additional details from Public Communities, Author, Body, and Photos for every community post. Google +1: Download content you gave +1 on external site and +1 you got. Download Links to articles, blog post and all other content you gave +1. 1). Visit – Takeout.Google.com to select necessary data to download. 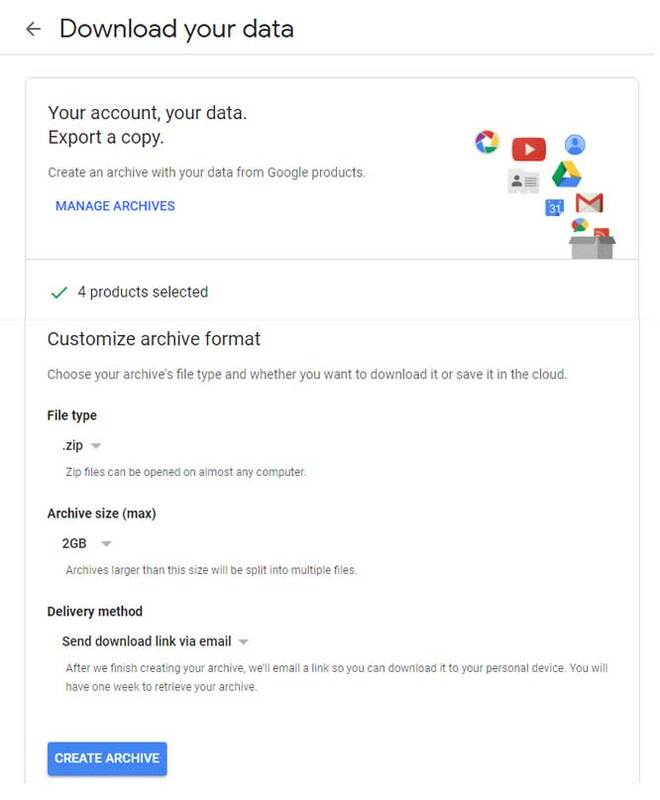 Google will convert everything into an Archive. By default, Google will pick the required sections to download. You can also specifically enable any other additional data you need. Click on Next. You will see the Manage Archive button. Scroll down to pick File Type from .zip and tgz. Zip is the popular archive format can be open in Winrar. For tgz you can use Winrar or 7-zip. Max archive size is 2GB, if your profile is bigger than the said size you can download that into parts of 2GB each. Click on CREATE ARCHIVE button. 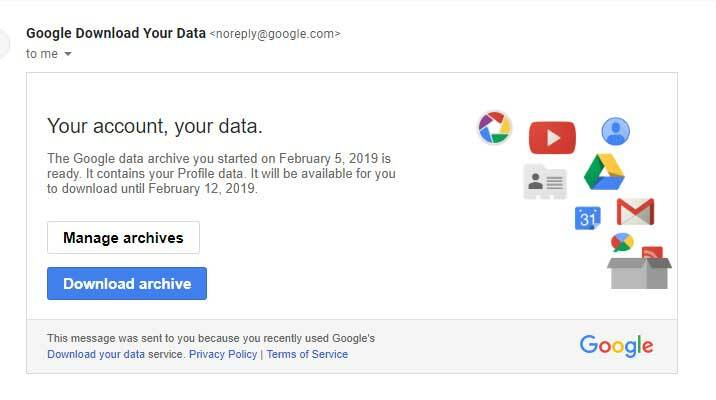 You will receive an email to download the Archive once it is completed or else revisit the takeout.google.com once the archive is complete. 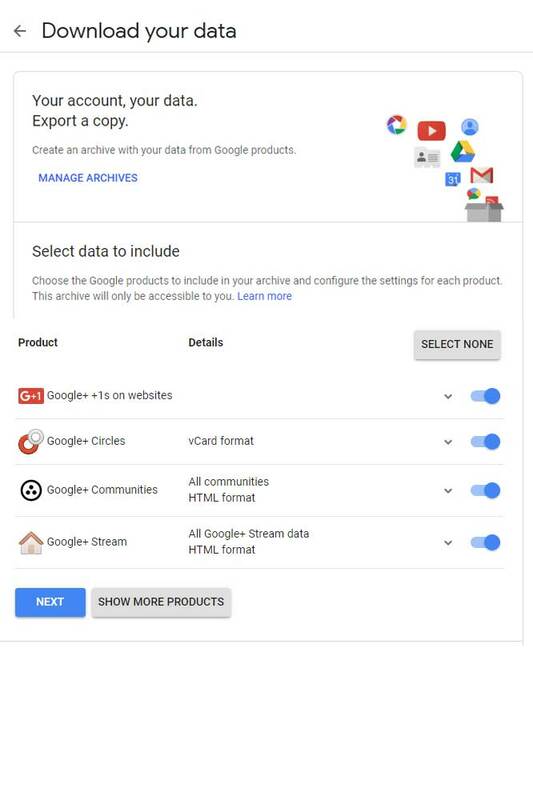 Click on Manage Archives to download your Google Plus data.